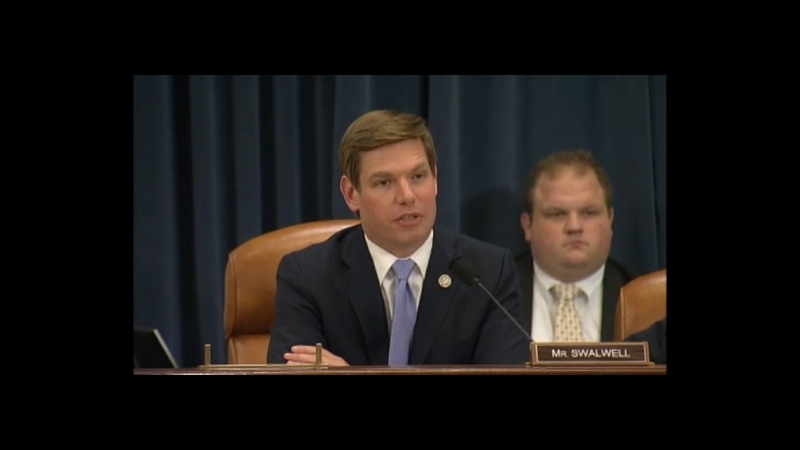 Bay Area Congressman Eric Swalwell is making the case that President Donald Trump's personal and financial ties to Russia are dangerous to American democracy. Swalwell, a Democrat from Dublin, has added a new special section to his official congressional website titled "Protecting Democracy." A banner on the website reads "Connecting the Trump-Russia Dots." It features photos of Russian President Vladimir Putin with key administration officials like Secretary of State Rex Tillerson and former National Security Advisor Michael Flynn, who resigned last month after 24 days in office. 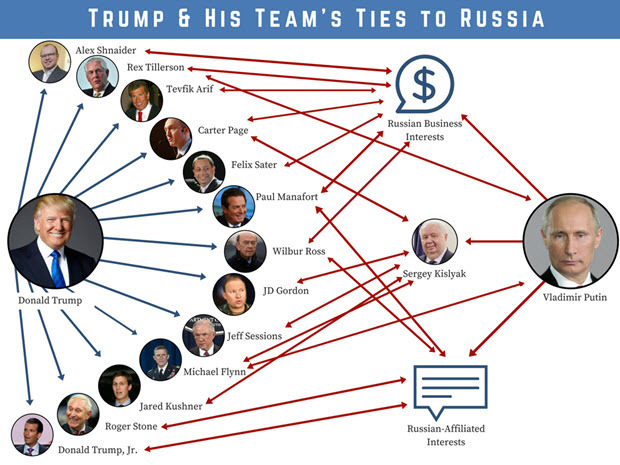 A diagram from Dublin Congressman Eric Swalwell's website details the alleged ties between President Donald Trump's administration officials and Russian operatives. "It’s a living website that grows every day. I wanted my constituents to understand in an unclassified way what's behind the administration's personal, political and financial ties with Russia and whether those ties converged with Russia’s election tampering," Swalwell said. "We laid it out to show that Russia is not our friend. They’re using and exploiting those ties." The site features links to dozens of news articles, media investigations and reports, including one from Amnesty International about Russian military activity in Syria that targets civilians. "Russia: Not Our Friend" it reads, before spelling out why Swalwell introduced a bill that would set up an independent, bipartisan commission to investigate ties between the Trump administration and Russia. Swalwell is a member of the House Permanent Select Committee on Intelligence, which is investigating Russia's alleged election meddling. U.S. intelligence agencies have concluded that Russian President Vladimir Putin authorized an operation to try to hurt Hillary Clinton's campaign and sway the 2016 election in Trump's favor. Swalwell has taken to the airways recently, appearing on Tucker Carlson's show and "The O'Reilly Factor" on Fox News, as well as making the rounds on cable news channels CNN and MSNBC. He jokes that he does TV appearances "so my conservative parents can see me on TV, but added that it’s important for Democrats to 'debunk myths' and make their case against Trump on conservative media outlets. "We’re not helpless here. We can have better security, protect our data. We don’t want to be in this mess again. We want to move on and be a democracy that everyone can look up to," he said. Swalwell is also engaging with national political personalities on Twitter. He tangled with Trump policy adviser Roger Stone. UC Berkeley professor of political science Jack Citrin said Swalwell's questioning at Monday's hearing was the "hallmark of his career." "He was professional, policy-oriented, not identifying himself as a super-progressive," Citrin said. "Being on that committee gives him the visibility and prominence to benefit his career." Swalwell's 15th district in the East Bay suburbs and the Tri-Valley area is solidly Democratic but not as liberal as neighboring Oakland, Berkeley or San Francisco, a fact that Swalwell is conscious of, Citrin said. "He's an up-and-comer in Democratic Party and probably the kind of Democrat who can go far in the national world, rather than the uniquely California political world," he added.